The ongoing war of words between the Inspector General of Police (IGP), Ibrahim Idris, and Sen. Isah Hamman Misau, may be far from over, as the lawmaker, on the floor of the Senate, on Wednesday, alleged that the Police chief has impregnated now marry a female police officer, which he said, is against the rule of the Police Service (PSC). Sen. Misau said the lady in question had since been promoted, despite her lack of qualification for the new rank. The senator, who is currently briefing his colleagues, said the corruption in the Force, under the current IGP, Ibrahim Idris, must be questioned if the integrity of the Force must be restored. Senate President Bukola Saraki, however, has constituted an adhoc committee to investigate the claims of financial fraud made by Sen. Misau and report to the Senate as soon as possible. The adhoc committee is to be headed by the Senate Deputy Chief Whip, Francis Alimikhena, while Nelson Effiong, Binta Garba, Obinna Ogba, Faseyi Duro, Abdulaziz Nyako and Suleiman Hukunyi are to serve as members. The Senate committee on Ethics, Privileges and Public Petitions, is to investigate other claims made by Misau against the IGP. The committee is expected to report in two weeks. “The adhoc committee we will set up will deal with all the allegations about misappropriation of funds made against the IGP. We will refer the other issues about personal misconduct against the IGP to the Senate committee on Ethics, Privileges and Public Petitions to for investigations,” Saraki said. No time frame was given, within which the committee will report back to the Senate for further legislative actions. 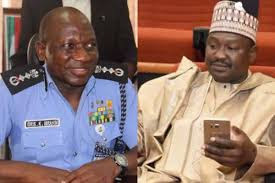 The face-off between Misau and police boss, Idris, started in August, when the lawmaker, in an interview granted to a national newspaper, claimed that police officers pay bribes to get favourable postings and promotions. The Police hierarchy disputed the claim. The IGP, through the Force spokesman, Jimoh Moshood, said Misau’s claims were unfounded and that he was only out to discredit the institution. He had further claimed that Misau deserted the Force and that he would soon be declared wanted to respond to a disciplinary committee set up to probe him. “It alleged that Misau dubiously absconded and deserted the Police on September 24, 2010, when he was redeployed to Niger State Command, consequent upon which he was queried, in line with the Public Service Rules. “The police also alleged that Misau had previously faced disciplinary investigation when he refused to proceed on Junior Command Course (JCC) 49/2008 at Staff College, Jos, between January 15, 2009, and June 19, 2009,” the Police spokesman had claimed. Misau, while raising a point of order on the floor of the Senate yesterday, said the IGP is yet to respond to all the allegations he made against him. He said rather than address the concerns he raised, the police hierarchy is dealing with trivialities. The senator added another new dimension to the ongoing rift, when he alleged that the IGP has hurriedly married a female police officer, after he impregnated her. He claimed that the said female police officer was already four months pregnant for the IGP, when he hurriedly arranged a marriage ceremony in Kaduna State. Misau said the pregnant female officer, has also compensated by the police IG, by illegally promoting her, despite her lack of qualification. The lawmaker said the marriage between the IGP and the female officer, contravenes the code of ethics of the Force. Misau in his long remarks, said: “During the recess a lot of things happened between me and the office of the IGP. I am a retired police officer and served for 10 years and my father was in the police too and served for 34 years.. In fact, he joined the police even before I was born. “So when I speak about police, I know what I am saying. When I speak about police, I speak on authority. I was concerned about what was happening in the police in terms of bribery which led the IG to be scared. “I called three serving officers and they confirmed to me that people pay much more than N500,000 to get promotion. Even the revenue the police is generating we know. Police is not supposed to generate money, meanwhile companies pay money to police to provide security for them. This is an open secret. It is obvious that even people with questionable character have police backing with siren all over the place. “One police officer is supposed to be for 400 people, but in Nigeria, it is one police officer to 800 people and a marketer for instance will have over 30 policemen, thereby depleting the few police we have meanwhile the ordinary citizens are left without adequate protection. Speaking on his claims that the IGP has impregnated a female police officer, Misau said: “I am aware that the IGP has impregnated a female officer in his office. Because he wanted to save his face, he hurriedly went ahead and married the woman. The wedding ceremony was held in Kaduna State.